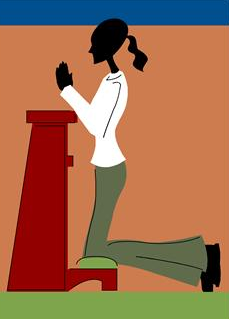 "I can't really get into praying until I'm on my knees," a friend confided to me. Her words lingered with me, I began making a practice of kneeling when I prayed in my 'closet,' and I sensed a change, not in God but in myself. It felt right to be in such a posture before Him. It's interesting to see the posture of Solomon in prayer, described in detail by the writer of 1 Kings. I'm glad he included that description, for it adds a jolt of realization about the relationship between God and us. Solomon, despite his giftedness, his touted wisdom, his unusual success spent part of this momentous day in Israel's history on his knees before God in front of all the people. The Bible mentions at least four prayer postures. That is actually how Solomon began his prayer - 1 Kings 8:22. Jesus' instructions about prayer imply that standing was a common stance - Mark 11:25. Abraham's servant bowed in prayer when he thanked God for answering his prayer about finding a wife for Isaac - Genesis 24:26. The Israelites bowed in worship when Moses returned with signs and a promise that God would free them from their Egyptian masters - Exodus 4:31. Sometime during his prayer, Solomon must have sunk to his knees, for that's the posture our writer describes him in at the end of his prayer - 1 Kings 8:54. Jesus is also described as kneeling when He prayed in Gethsemane - Luke 22:41. That's how the people of Israel prayed in response to Ezra reading 'the book' to them - Nehemiah 8:6. Jesus was also on His face in Gethsemane - Matthew 26:39. No prayer posture is prescribed or given more honor than any other. Rather it seems that the posture may indicate the state of our heart, the fervency of our felt neediness, and can become a physical demonstration of our humanity, humbled before deity. What position do you prefer to be in when you pray? Does it make a difference to you? Have you ever experimented with different ones? Of course the main thing is the posture of my heart and yours. PRAYER: Dear God, I love the variety of prayer postures seen in Your word. Help me to always have the spiritual posture of humility before You, whatever physical position I'm in. Amen. Pray to seek God's face, NOT just His hand. Pray with your heart fixed on god's glory, NOT just for personal satisfaction. Pray from the treasury of God's word, NOT from a list of your own ideas. Pray according to the Spirit's instruction, NOT only from human reason. Pray with a heart completely surrendered to His will, NOT with a hurried personal agenda. Pray in anticipation of living triumphantly in the war zone, NOT in satisfaction with your comfort zone. Pray that God would change you, NOT simply change things - Daniel Henderson, Transforming Prayer, pages 157-158.